Thanks Jim — as a painter, I find it gratifying that a sensitive viewer should raise the ethics, or one might call it the response-ability of the implicit participant. Another layer suggests itself to me however — having to do with the change that has occurred since the development of digital media. The viewer in this case cannot be said to have actually encountered Fischl’s ( or anyone other artist’s) work — but rather a “ghost” of the work. Furthermore, digital “users” of art can, at will, “operate on” the work, making a collage of it or altering it in multiple ways — in effect committing travesty. And I would argue that any other gaze than the personal one offered “in person” is not the sort of participation that painting traditionally invited — but is, rather, a form of violence. It could be analogous to a conversation in which the listener doesn’t actually listen but simply awaits his turn to speak. Obviously I am over- simplifying to make a point. But after many years of the painstaking labor of making a work of art, and the “courtesia” of extending an offering to the conversation, I’d be more interested in amgenuine encounter on the part of my viewer. Of course thisminvolves some potential inconvenience — such as making the effort, or traveling the distance to actually see a painting. But them, the hundreds of hours that that artist expends on a work is a commensurate “inconvenience”. The ethics of digital viewership needs discussion as well I think. Bruce, thanks for bringing up the ethics of digital viewership. It is especially appropriate considering that this is a blog, and all works of art shown here are digital! I appreciate your point that “any other gaze than the personal one offered ‘in person’ … is a form of violence.” Perhaps the impersonal nature of the internet is deceiving because it allows us to forget that works of art are offered by persons and for persons. I also agree that the digital image is no substitute for a physical image (provided a physical image exists). It seems to me that digital images of paintings can be dangerous because they convince us that all we need is a mere simulacrum, but I find that the original in all its physicality, substance, volume and place is always far richer. But this makes me think that the ethics of digital viewership is perhaps one instance of a much larger problem: the ethics of a digital life. So many technologies present the tantalizing possibility of replacing certain aspects of our lived and physical existence with a digital one. But, a life without bodies is a life in isolation. Perhaps the danger of digital media is that we get what we want without feeling the loss of what we need. In some ways, even a blog like this one might have the effect of replacing ‘real life’ conversations. Hopefully, we can find ways to appropriately use digital technology so that it becomes an aide for physical reality, and not the other way around. I’m unnerved, disturbed, and often angered by pieces of art that make me, as the viewer, “complicit” in anything. I can’t experience a piece of art until I experience it. I can’t accept that that experience, rather than a particular response of mine to it, makes me “complicit”. The Eavesdropper of the painting might be looking at me, inviting to join her in her auditory voyeurism. In that case, is my only moral response to leave the situation by walking away from the painting? If I linger to look at it, to enjoy the painting (enjoying vs. contemplating, i.e. studying certain technical aspects of it), am I enjoying the feeling it provides of doing something wrong – a feeling which I should not, after all, enjoy? If that is the painting’s invitation, I am not complicit if I walk away. I am only complicit if I stay and join in. But has the artist been uncharitable by inviting me into such a situation? If my empathy is increased by being the viewer of the second painting – by knowing how disturbing it is to have that objectifying, dignity-stealing gaze turned on me – then well and good. But in that case I am standing in the place of a victim, not a complicit participant. If, however, the artist is trying to implicate the viewer by forcing him or her into the place of a person willingly degrading herself – implying that, by standing in that place, the viewer is also willingly participating in an act of degradation – my response is outrage, not compunction. I can’t accept that I, the viewer, am implicated just by receiving the artist’s communication. How I respond to that communication may implicate me; but any attempt to place me into a situation and then accuse me for being put into that situation does not in fact reflect any guilty action on my part, but a guilty action on the part of the artist. Is he himself not primarily complicit in the situation, as its manipulator – the one who betrays the trust the viewer places in him in order to violate the viewer? Cole, thank you for this comment, and I apologize if these images disturbed you in any way. I think, perhaps, you misunderstood my use of ‘complicit’. I did not mean it in its more literal sense of actual wrongdoing in an illegal activity. I do not think there is anything illegal, or morally problematic, about looking at these paintings. My point was that by looking at the scenes we become participants in a fictional wrongdoing. In other words, the paintings are depictions of what appears to me to be morally problematic behavior. 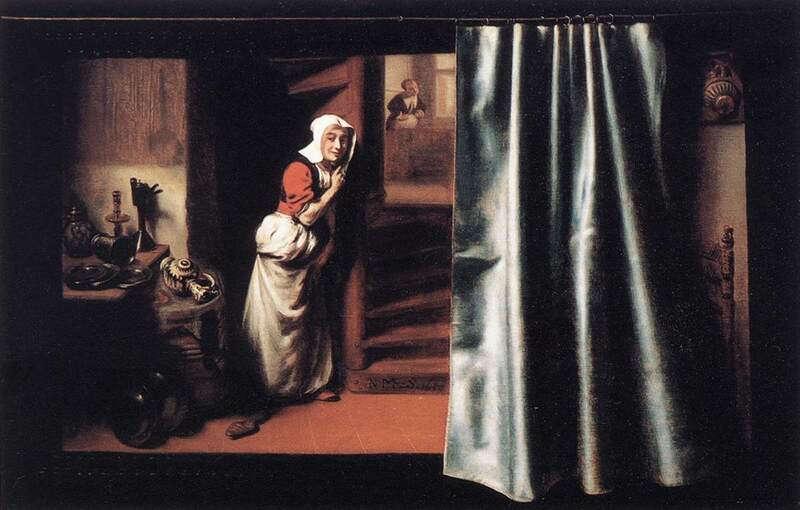 The paintings are also made in such a way that they assume the presence of the viewer as PART OF that scene: the maid looks out at the viewer, and the man in the chair looks out at the viewer. When the viewer looks at the painting, especially when the viewer meets the gaze of the fictional characters, the viewer becomes a fictional participant in the scene. I was using ‘complicit’ as more or less a synonym for participant because in this case the viewer is fictionally participating in a scene portraying a morally problematic activity. To a certain extent, I think that all paintings do what these two paintings above do. It seems that nearly all paintings assume the presence of a viewer, at the very least of an eye that can perceive the painting, but not all paintings do this in so direct a way as these two paintings. What is happening in these paintings is analogous to the use of the ‘aside’ in the theatre. By using an ‘aside,’ by speaking directly to the audience, the distance between actors and audience is diminished, and the audience may feel that they are more directly involved in the plot unfolding before them. A similar technique is being used here. By including characters that look out at the audience, these paintings make the viewer feel they are more involved in the scene than they would otherwise. You suggest later on that even the artist would be implicated in a violation of trust were he to use a work of art to manipulate the viewer. I agree with this, and I don’t think that these paintings manipulate the viewer, in the sense of forcing the viewer to do something he or she does not want to do. It is also worth pointing out that the opposite is equally problematic. A painting that is somehow ‘indifferent’ to the viewer would be equally impersonal and de-humanizing. I think that some photorealist paintings come close to attaining this level of impersonality. I think that art functions properly when it exists in a relation of trust between artist and audience. But this might mean that the audience needs to let go of a sense of absolute freedom in respect to the work of art if they are to fully appreciate it. As these paintings suggest, it is a grace of painting that one can look away. But not looking is simply not participating. And because looking is, itself, a moral activity I am open to the possibility that not looking is the proper response to a painting. I am not convinced that is the appropriate response to the paintings above, and in order to appreciate and understand these paintings one needs to place their trust in the artist and become a participant in a fictional world. You’re right, I misinterpreted the use of your word ‘complicit’. 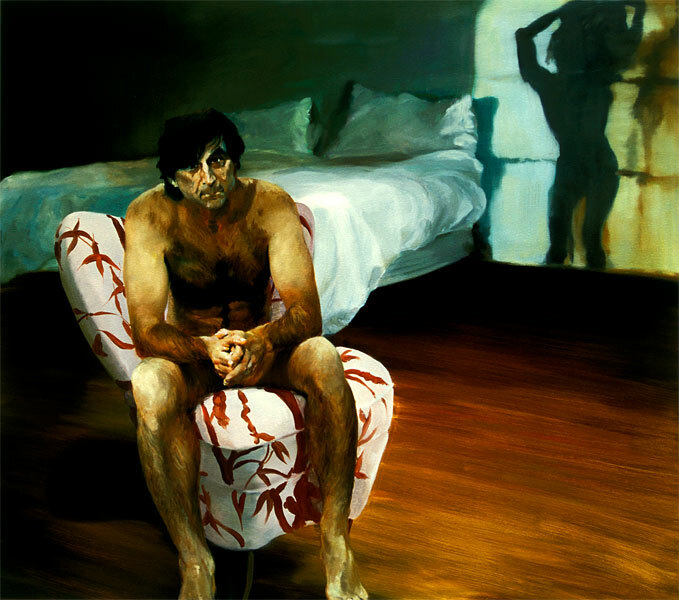 I see now that what you were saying is that, in these paintings, the viewer himself is not made to be complicit (in the sense of guilty because of cooperation in morally problematic behaviour), but is rather invited to play a part, to inhabit a character in the scene who is involved in morally problematic behaviour. The guilt attaches to the character, not the viewer. At the same time, the paintings are particularly powerful because the viewer is invited to action within the drama of the scene, instead of merely watching the scene unfold from the outside. Correct me if I’m misunderstanding you. The use of the word ‘complicit’ pushes my buttons because of its use to refer to the audience in some forms of performance art, in which the artist is in fact trying to make the audience member a participant in an action which violates social norms, simply by the fact of his being a viewer. That is, these artworks imply that the viewer is himself guilty because of his role as audience member – but the viewer is not warned that he is going to be placed in a situation of guilt until he is already in it. In these cases, the artist has taken advantage of the trust the audience placed in him in order to do them a disservice, in which he manipulates the situation to make them the perpetrators and himself the victim. (See the double-bind that some of Chris Burden’s pieces placed on his audience through his exploitation of the bystander effect, which I discussed here: http://colematson.com/2009/12/08/performance-art-the-cruelty-of-the-artist-as-other/). I agree with your last paragraph, especially, including the statement that a viewer must place their trust in the artist and surrender in order to truly enter into an artwork. Since such trust is necessary, it is also necessary for the artist to remember he has a responsibility not to betray that trust. Cole, you nevertheless make an excellent point about the attempts of some artists to actively manipulate the viewer, such that the only really ethical response is to either look away or flatly protest. In my own field of literature, there are similar tensions between mere invitations to observe and temptations to become complicit. (When students object to morally-questionable content in literature, they are usually picking up on exactly this problem without making the necessary distinction.) The presence of a speaker implies a listener, and the presence of a narrator implies a naratee, as one theorist calls it. And in the literary world, the idea of a “conversation” between speaker and listener is no mere metaphor, but entirely literal. Two rather literary different examples come to mind. In canto 30 of Dante’s Inferno, Dante and Virgil encounter the shade of Master Adam, a famous counterfeiter, who trades juicy insults with Sinon, a treacherous Greek who persuaded the Trojans to bring the wooden horse into the city. The insults are clever and juicy, and after Dante has listened for a while, Virgil denounces his prolonged interest in a vacuous dispute. At that point, we as readers probably realize that we, like Dante, have been enjoying the dispute too much, and Virgil’s rebuke is aimed at us as much as at his companion. Did Dante (the author) set us up for a fall? Or did we do it to ourselves? The second example is Seamus Heaney’s poem “Punishment,” a meditation on a mummified body excavated from a peat bog. The body was a young woman who had been strangled and thrown into the bog naked. The speaker of the poem suggests that she was being executed for adultery, and imagines the moment of her death. In so doing, he sets himself up as a complicit observer of the original act of violence, and I think implicates his readers for joining him in his tacit approval. There’s more to the poem than that, but the point is that the poem invites the very kind of voyeurism that it then criticizes. Such waters are difficult to navigate, but I think that one of the advantages of such poetic fictions is that they provide us with just such opportunities to measure and evaluate our moral reflexes without facing real temptation. After all, what we are enjoying in Dante is not an actual argument between enemies, but a simulated one. And what we are watching in Heaney’s poem is not a real execution, but the author’s imaginative recreation of one. If the arts necessarily have moral components, I think this is a big part. Thanks for your comment, and especially the examples. I can’t say much else except that I agree, and will think more about it. Dante’s poem, especially, seems to me to be one work in which the boundaries between the fiction and the reality are blurred, so much so that, as I understand, some of his contemporaries would pass him on the street and whisper to each other, “There’s the man who’s been to Hell!” Testing our reactions to the events of the story really does test our actual moral character.